Kakadu lies in the far North of Australia. If you started your travel somewhere in the South-East - like Sydney or Melbourne - you need to get up here first. The distances in Australia are huge, so the best option is to fly into Darwin, the laid back capital of the Northern Territory. You could fly to Alice Springs or Ayers Rock, hire a campervan and - after exploring the "red centre" - drive north on the Stuart Hwy. This is a drive I love. The scenery is magnificent and there are tourist attractions to visit on the way, like the Devils Marbles, the Mataranka Hot Springs or Katherine Gorge, to name a few. But beware, we're talking about 1200km to the southern entrance of Kakadu, and nearly 1500km to Darwin. Kakadu has two entrances. The northern entrance can be reached via the Arnhem Hwy and is roughly 150 km south-east of Darwin. 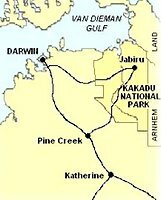 Most people and all organised tours start from Darwin and take this route. What kind of transport you choose to get around Kakadu depends on your personality and the amount of time you have. Many people join an organised Kakadu tour. There are literally hundreds of options. 1, 2, 3-day or longer trips. Big coaches or small four wheel drive buses. Tours specifically for young people, for the adventurous, for those interested in nature, those interested in Aboriginal culture. There are tours that will take you to a bushcamp at night, and tours that put you in a luxury hotel room. I'm sure you will find something to suit you. The other option is self-driving, be it your own car or a rented vehicle. The two main roads through Kakadu - the Arnhem and the Kakadu Hwy - are bitumen roads. Most other roads in Kakadu National Park are well maintained gravel roads and there are also some real four wheel drive tracks. While most of the "big attractions" of Kakadu National Park are accessible by two wheel drive, all the great gorges, waterfalls and rock pools for swimming are along unsealed roads. Beware that hired 2WD vehicles are not allowed to drive on unsealed roads! Read more here: 2WD or 4WD for Kakadu?